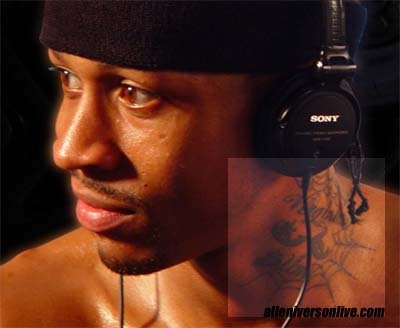 List of available content in Tattoos: The meaning behind Allen Iverson's tattoos. 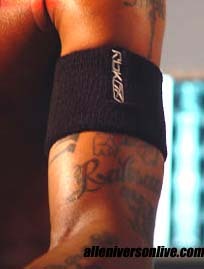 You've probably seen Allen Iverson's tattoos. You've probably wondered, "why the hell does he have so many tattoos? But before you judge him, you should learn what his tattoos mean. The truth is, there's a deeper meaning behind each tattoo. 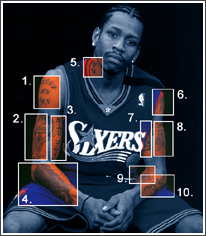 So, before you judge Allen Iverson's character, see what his tattoos represent and what they mean. When Allen Iverson first came into the NBA, he had only one tattoo from college - it was a bulldog with his nickname, "The Answer" (See Below). 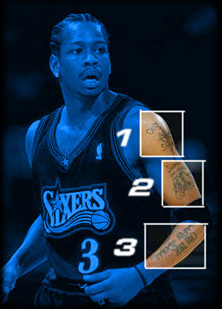 It wasn't until the third season that Iverson decided to get more tattoos (7 in his third year). 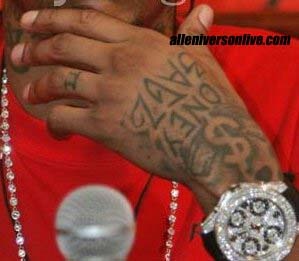 With the press already criticizing Iverson as rebellious, his tattoos took him to a new level. Incidentally, it was the same time Iverson had a break-out season, becoming the league's top player and taking Philadelphia 76ers to the playoffs for the first time in 8 years. The truth is, there's a deep meaning behind every one of his tattoos. Every tattoo represents something he believes in, something he has experienced, something he cares about, or even something he wants to tell the world. His mental state is much stronger. He is more focused. Whenever he needs inspiration, he just looks at his tattoos and remember that he's fighting for what he believes in. Did the tattoos improve his game? That's for you to decide. 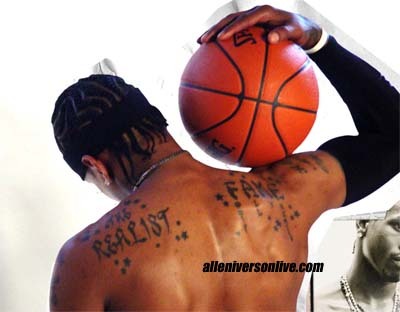 An incident occured where Hoop Magazine (the official NBA magazine) airbrushed out Allen Iverson's tattoos, which upset him. "[The photo] was an insult, terrible," Iverson said. "I wish they wouldn't use me at all if they can't accept all of me. I have things on my body that are just tattoos to others but mean a lot to me, about my mother, my grandmother, my kids, my fiancée. These aren't just tattoos to me." Left Neck - Surrounding the original CT is a spider web, above it is "Virginia" were AI was born and raised. "Money Bagz" - on left hand. 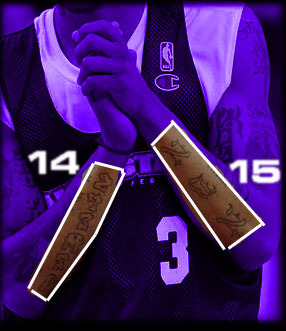 "RA Boogie" - On the left side of his neck, in memory of his childhood friend, Rashaan, who was shot. 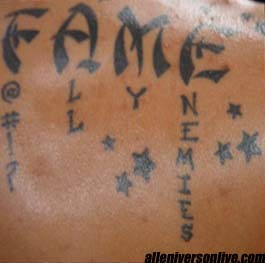 "FAME" - F@#!? ALL MY ENEMIES - Unveiled in his latest commercial shoot for the Answer X. "Rahsan" - Right under the "The Answer" (Bulldog) tattoo, is a one that spells his fallen friend's name. Click on the sections for more detailed meanings of the tattoos.